Juxtaposing political lyrics with rug-cutting instrumentation isn't revolutionary. But of the recent spate of antiwar tunes, none is quite as compelling as those of Michael Franti. Two years ago the rapper-turned-singing-sage journeyed to Iraq and Israel, where he met children, soldiers and families transformed by war. The jarring experience inspired this protest album -- its title a crowded-theater reference to the urgency of today's global political climate -- as well as a documentary film, "I Know I'm Not Alone." Franti doesn't scream for change. This joyous fusion of reggae, hip-hop and soul is a gentle, galvanizing call to arms that makes you want to hug somebody -- anybody. That's because Franti's singing voice feels like a huge, warm bearhug. (Like tots meeting Santa, strangers line up after concerts to be embraced by the 6-foot-6, barefoot activist.) Even when Franti hammers his point on "Time to Go Home," his urging is more illuminating than admonishing. "I believe in the miracle," he proclaims on "One Step Closer to You." 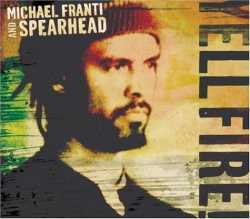 Franti's adaptable band, Spearhead, was helped on several tracks by reggae riddim godfathers Sly & Robbie. Other tunes explore light grooves (the delicate, idealistic "Sweet Little Lies"), fiery guitar-rock (the title track) or even strive for Triple A radio playlists ("I Know I'm Not Alone"). Despite the crusading subject matter, this is Franti's most instantly appealing disc -- a treasure that many mainstream listeners would be delighted to discover. "I Know I'm Not Alone,"